To Cite: Beheshti Monfared M, Ghaderi H, Faghihi Langroudi T, Mirjafari S A, Foroughi M, et al. Anomalous Origin of the Right Coronary Artery from the Mid-Portion of the Left Anterior Descending Artery in a Patient with Single Left Coronary Artery: A Rare Coronary Artery Anomaly and Review of Literature, Iran J Radiol. 2017 ; 14(1):e13458. doi: 10.5812/iranjradiol.23484. Origination of the right coronary artery (RCA) from the left anterior descending (LAD) artery is a case of single coronary artery. It is an extremely rare coronary artery abnormality and usually an incidental finding during coronary angiography. A 73-year-old man with a medical history of hypertension arrived with chest pain. Medical therapy started for ST elevated myocardial ischemia. 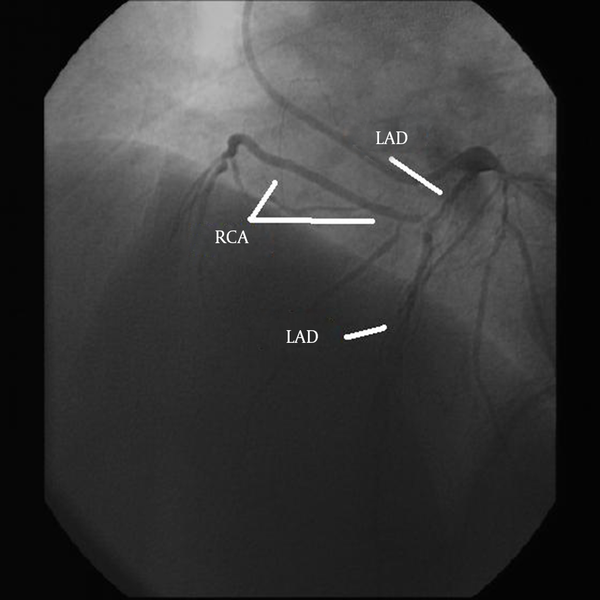 During his diagnostic coronary angiogram, RCA was visualized as abnormally orientating from the mid-portion of LAD. A significant lesion in the proximal part of LAD, significant long lesion in the diagonal artery, and several stenoses in the obtuse marginal artery (OMA) were observed. 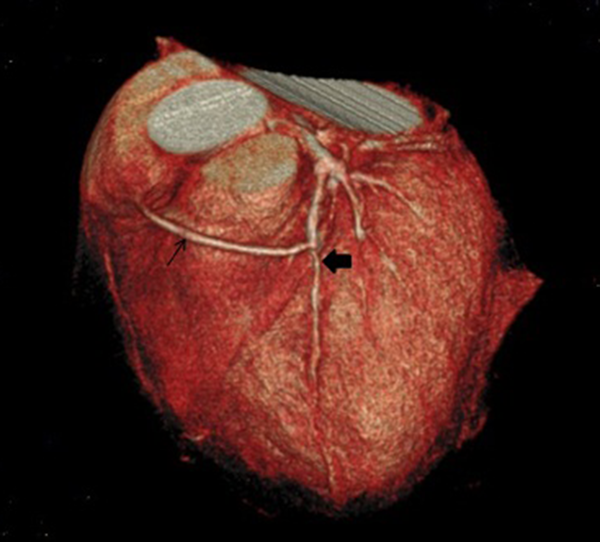 To evaluate the course of RCA, coronary computed tomography angiography (coronary CTA) scan was performed. The patient underwent coronary artery bypass graft (CABG) for three vessels. He was discharged without any complication and no problems were detected in follow-up. In conclusion, if during classic angiography, RCA is not seen, the physician should keep in mind that RCA may originate from LAD. Current classification cannot exactly determine this anomaly and needs revision. When there is suspicion for coronary anomaly, performing coronary CTA can be helpful for better management and planning of therapy. The term “single coronary artery” emphasizes on a coronary artery originating from a single coronary ostium on the aorta. Origination of the right coronary artery (RCA) from the left anterior descending (LAD) artery is a type of single coronary artery that is an extremely rare coronary artery abnormality (incidence 0.024%) (1). It is usually an incidental finding during coronary angiography (2). We found only less than 40 case reports in which RCA originated from LAD and just less than 15 case reports in which RCA originated from the mid-portion of LAD in PubMed. In most of the published cases, anomalous RCA originated from the left main artery (LMA) or proximal portion of LAD (3). We present a patient with multiple stenoses in the proximal part of LAD, long lesion in the diagonal artery, several stenoses in the obtuse marginal artery (OMA), and RCA arose from the mid-portion of LAD. A 73-year-old man was admitted to our hospital complaining of chest pain and functional class III-IV. His medical history consisted of hypertension. He was a smoker and had suffered from chest pain for 2 weeks. On admission, his electrocardiogram (ECG) showed ST segment elevation in leads I, II, aVL and V3-V6 associated with right anterior hemiblock. Cardiac enzyme levels were elevated. His transthoracic echocardiogram was normal. Medical therapy was started for ST elevated myocardial ischemia and diagnostic coronary angiogram was performed. During his diagnostic coronary angiogram, multiple attempts for cannulation of the RCA by right Judkins catheter were unsuccessful and the catheter could not be engaged in the ostium of the RCA. Aortic root angiography showed no definite origin for RCA on the right sinus of Valsalva. 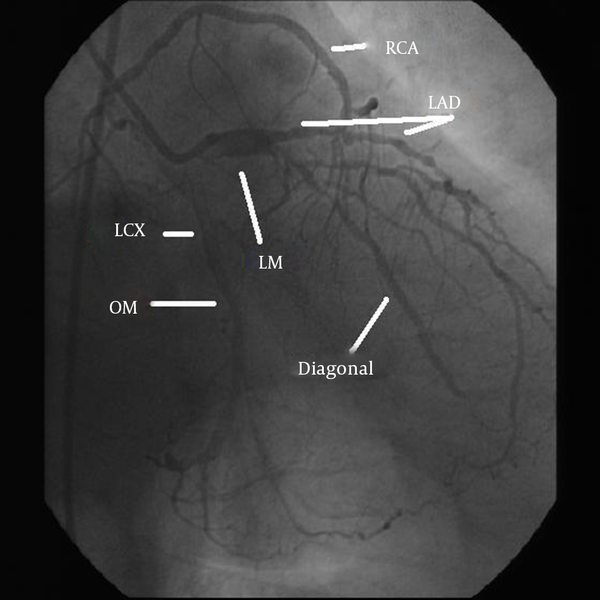 The left coronary ostium was located normally and its cannulation was performed displaying a normal course of LAD and showed dominance of left circumflex (LCX) (Figures 1 and 2). RCA was visualized originating anomalously from the mid-portion of LAD. A significant lesion in the proximal part of LAD, significant long lesion in the diagonal artery and several stenoses in OMA were observed. Left ventriculography was normal, with an ejection fraction of 55%. Neither aortography nor pulmonary artery angiography showed presence of another origin for a supplementary RCA. Figure 1. A 73-year-old man with chest pain who underwent angiography. Right coronary artery originating from the mid-portion of the left anterior descending artery. LAD, left anterior descending; RCA, Right Coronary Artery. Figure 2. Right coronary artery originating from the mid portion of the left anterior descending Artery. LM, left main; LAD, left anterior descending; OM, obtuse marginal; LCX, left circumflex artery; RCA, right coronary artery. To evaluate the course of RCA (posterior or anterior to the pulmonary artery) and to exclude the presence of any origin for a supplementary RCA from another site, coronary CTA was performed using 64-slice single-source scanner (Brilliance 64, Philips Medical System, Cleveland, OH, USA) (Figures 3 and 4). The coronary CTA showed the origin of RCA on the mid-portion of LAD passing horizontally anterior to the pulmonary artery and entering the right atrioventricular groove. Figure 3. Maximum intensity projection in axial (A) and coronal (B) planes of coronary computed tomography angiography. The right coronary artery (thin arrow) originates from the midportion of the left anterior descending (thick arrow) passing anterior to the pulmonary artery. Figure 4. Three-dimensional volume-rendered reconstruction of coronary computed tomography angiography angiogram. Right coronary artery (thin arrow) originates from the midportion of the left anterior descending (thick arrow) passing anterior to the pulmonary artery. The patient was referred for coronary artery bypass graft (CABG) and he was evaluated by cardiovascular surgeons for surgical treatment. The patient underwent coronary artery bypass graft and the findings during surgery confirmed the findings of angiography and coronary CTA (Figure 5). He underwent coronary artery bypass grafting (CABG) for three vessels; left internal mammary artery (LIMA) to LAD, and three saphenous vein grafts to RCA and diagonal and OMA. He was discharged 8 days after surgery with no complication. His echocardiogram on follow-up showed good biventricular function. Figure 5. The course of the right coronary artery. A, Intraoperative photo; B, After coronary artery bypass graft (CABG). LAD, left anterior descending; RCA, right coronary artery; AO, aorta; PA, pulmonary artery; LIMA to LAD, anastomosis of left internal mammary artery to left anterior descending artery; SVG to AO, anastomosis of saphenous vein grafts to aorta; SVG to RCA, anastomosis of saphenous vein grafts to right coronary artery. Coronary artery anomaly exists in 0.6% to 5.6% of patients undergoing coronary angiography, 1% of routine autopsy studies (3, 4), and 2.93% of coronary CT angiographies (5). The most common coronary anomaly is the circumflex coronary artery arising from the right sinus or from RCA (0.37% - 0.6%) (2, 5), right coronary artery arising from the left sinus of Valsalva and the left main coronary artery arising abnormally from the right sinus of Valsalva (0.17% in autopsy series and 0.1% - 0.3% in patients undergoing catheterization or echocardiography) (2, 6, 7). Lipton reported single coronary artery in approximately 0.024% of the general population (1). A variety of anomalous origins of RCA (left anterior sinus with variable courses, ascending aorta above the sinus level, descending thoracic aorta, left main coronary artery, circumflex coronary artery, the pulmonary arteries, or below the aortic valve) have been reported (8, 9). Anomalous origin of RCA (ARCA) from LAD has rarely been reported and we found only less than 40 published cases with this specific coronary anomaly (10). In the most of these reported cases, ARCA originated from LM (2, 7). There was only 15 reported cases in which the origin of ARCA was from the midportion of LAD (2, 3) (Table 1). Abbreviations: CABG, coronary artery bypass graft; CAD, coronary artery disease; ECG, electrocardiogram; F, female; M, Male; LAD, left anterior descending artery; OM, obtuse marginal; PA, pulmonary artery; RCA, right coronary artery; PCI, percutaneous coronary intervention. According to modified Lipton classification, our case can be categorized as “LIIA” anomaly (23). (L type: single coronary artery arising from the left sinus of Valsalva; group II: arise from the proximal part of the normal right or left coronary artery; A (anterior): anomalous coronary artery passes anterior to the pulmonary artery) (3, 23). However, this classification can not exactly define a coronary artery anomaly that originates from the midportion of LAD. Although single coronary artery is commonly associated with other congenital cardiovascular anomalies such as transposition of the great vessels, coronary arteriovenous fistula, bicuspid aortic valve, tetralogy of Fallot and origin from the pulmonary artery (3), most of the patients (97%) with RCA arising from LAD have a structurally normal heart (9). Only two of the cases had association with tetralogy of Fallot (24, 25). Prognosis of this type of anomaly on depends on the coronary perfusion. The anomalous vessel with the interarterial course (between aorta and pulmonary arteries) is considered malignant or serious and the prognosis is better for a vessel with an anterior course .If the course of RCA is not between the aorta and pulmonary artery, this anomaly has a better prognosis (2). Benign anomalous addresses an anomalous in which the LCX originates from the right circulation (26, 27) and we will not discuss this anomaly in this article. If ARCA is compressed between the pulmonary artery and aorta, myocardial ischemia and sudden death may occur (3, 28). Some studies suggest that ARCA is prone to atherosclerosis (22) but in 15% of patients with ARCA, myocardial ischemia can progress without atherosclerosis (3). Some hypotheses explain myocardial ischemia and sudden death due to coronary vasospasm, acute angle take off, slit like orifice, intramural course, and compression by the great vessels (3). Some studies based on autopsy cases have shown that slit-like orifice structure and acute angle take off are more common in sudden cardiac death patients (2, 25, 29). Patients with ARCA may be asymptomatic and 25% of them die suddenly (29). Patients with coronary anomaly may present with chest pain, dyspnea, palpitation, syncope, sudden death, ventricular fibrillation or myocardial infarction (3). Our patient presented with myocardial infarction. A diagnostic tool for ARCA is coronary angiography and they are usually an incidental finding. If RCA is not seen during classic angiography, the physician should keep in mind that RCA can originate from LAD. Coronary CTA is a very useful diagnostic tool to determine the anatomy of the coronary arteries, the possible anomalies, and their relationship with great vessels (30). CT angiography is the gold standard investigation tool in evaluating coronary anomalies and their anatomic relationship to adjacent structures (3, 30). Recent guidelines and appropriateness criteria favor the use of coronary CTA for the evaluation of coronary anomalies (31). Treatments for coronary anomaly include medical therapy, percutaneous coronary intervention (PCI), and surgery. Medical treatment is useful when the patient is asymptomatic and ARCA is not malignant or in other words is not compressed between the aorta and pulmonary artery (3). Although some studies reported PCI for anomalous RCA arising from LAD, but PCI is not wildly used because of single coronary orifice and different anatomical structures in these patients (3). Cardiac surgery is very important in these patients. Recommended surgical therapies in this anomaly include ostioplasty, bypass graft of the RCA, reimplantation of RCA to the aorta, and pulmonary artery translocation (2, 3). However, the long-term outcome of such therapies is not confirmed. In conclusion, when RCA is not seen during classic angiography, the physician should keep in mind that RCA can originate from LAD. Anomalous RCA usually stems from proximal or mid-portion of LAD. Current classification cannot exactly determine this anomaly and it needs to be revised. When there is suspicion for coronary anomaly, then performing coronary CTA for better management and planning of therapy can be helpful. Authors’ Contributions: All authors contributed extensively to the work presented in this paper. Seyedeh Adeleh Mirjafari was the corresponding author and helped in all aspects. Mahmoud Beheshti Monfared and Hamid Ghaderi were the cardiac surgeons. Mohammad Forozeshfard was the anesthesiologist. Taraneh Faghihi Langroudi contributed to the radiologic findings. Farshid Heidarpour Kiaie was the technical and material support. Seyedeh Adeleh Mirjafari and Mahnoosh Foroughi prepared the case and helped in the discussion part. All authors contributed to the writing of the manuscript. All authors read and approved the final manuscript.